Well, it rhymes if you say “chamomile” au français. I “discovered” it a few years back – truth be told, it was that old No Doubt song “Hey Baby” that made me want to try it. Dang, I still don’t have their new album. The herb garden is doing well for being so young. 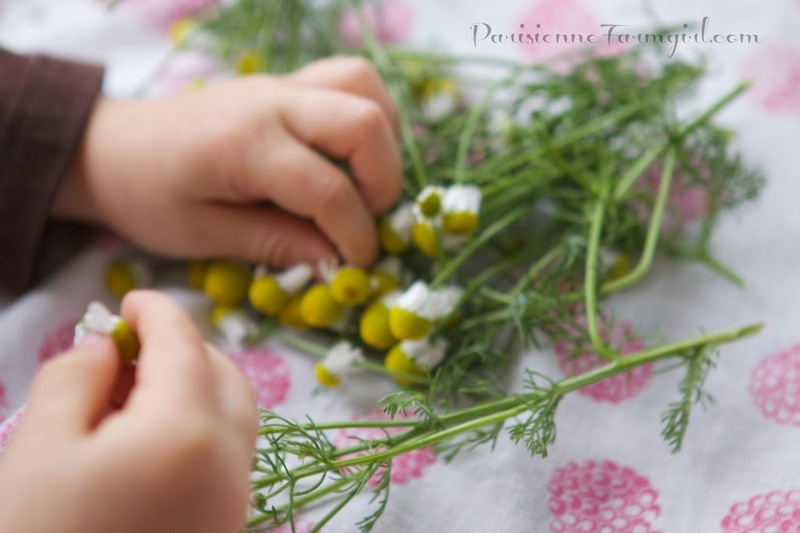 I was able to raid my old garden a couple weeks ago and transplanted some chamomile and the blooms were calling me today. 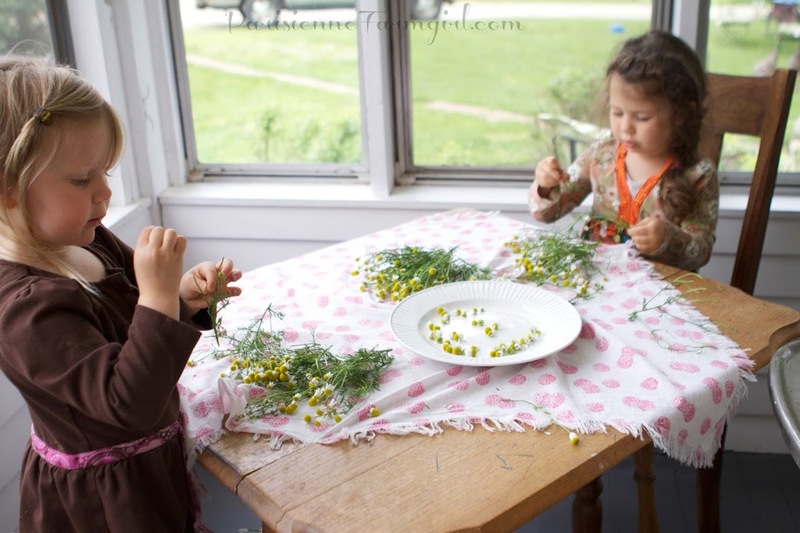 The children love to help with the harvest and it is simple for them to pop off the little flowers. The smell fills the air where we work and the conversation is so sweet. 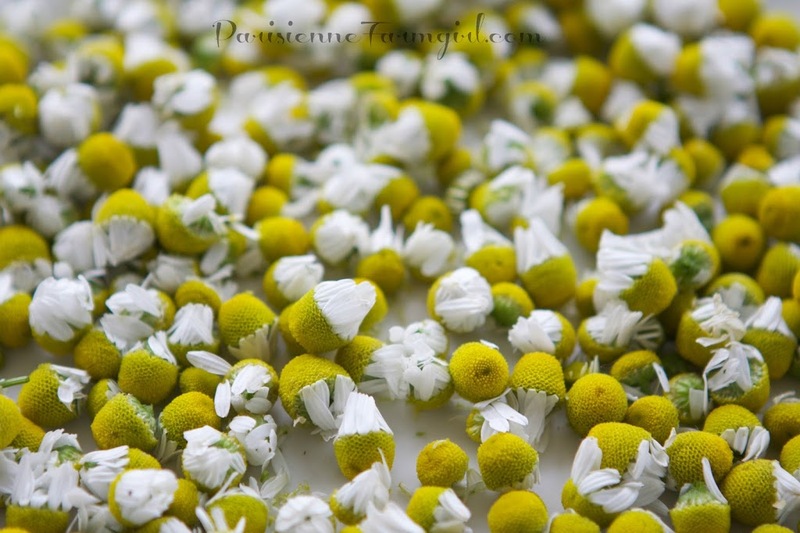 The other day I planted an additional 3,000 seeds – so we should have plenty of chamomile coming soon. When I smell it, I just want to keep inhaling – I just don’t want to get away from the aroma I love it some much. I love to bake with chamomile. 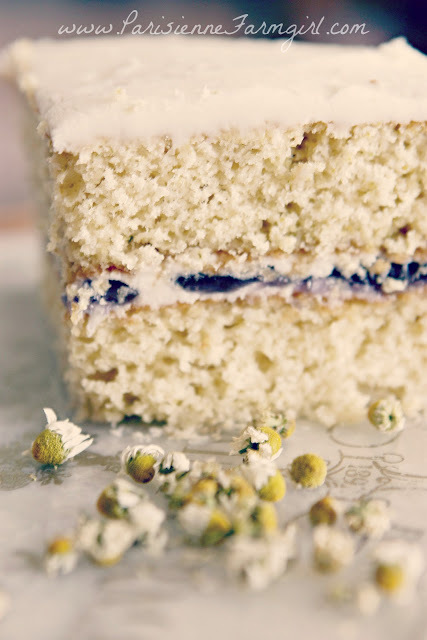 Remember last years chamomile and lavender cake? And every day I have a cup of tea around 3:30. Next year, when we have our bee hives my cup of tea will entirely come from la ferme a mi-chemin. I’ve written about it many times before. We are so blessed to grow things aren’t we? How much pleasure comes from growing your own delights? 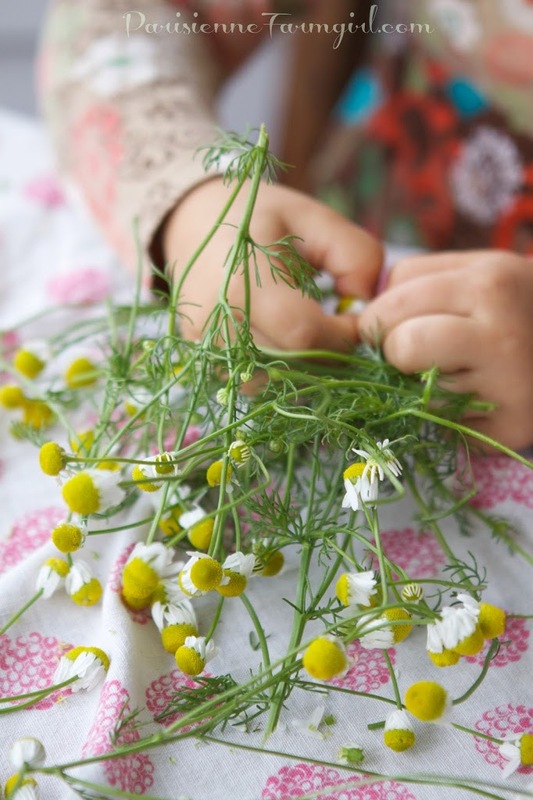 Harvesting chamomile is so simple… just remove the flowers, petals and all – no stems and leave them to dry. Once dry you can keep them whole or crumble them up. You can then use them in infuse sugar and make a cup of tea. On a 57 degree day in JUNE we can enjoy the clucking of the chickens and the songs of the robins darting back and forth. When you feel it – savor it. That, and a cup of chamomile tea. My chamomile went crazy this year reseeding EVERYWHERE and dang if you can’t yank a whole plant out in irritation only to be overcome with guilt (I can’t thin my seedlings without feeling like a murderess), digging a deep hole to replant it and this morning it’s just fine and dandy. 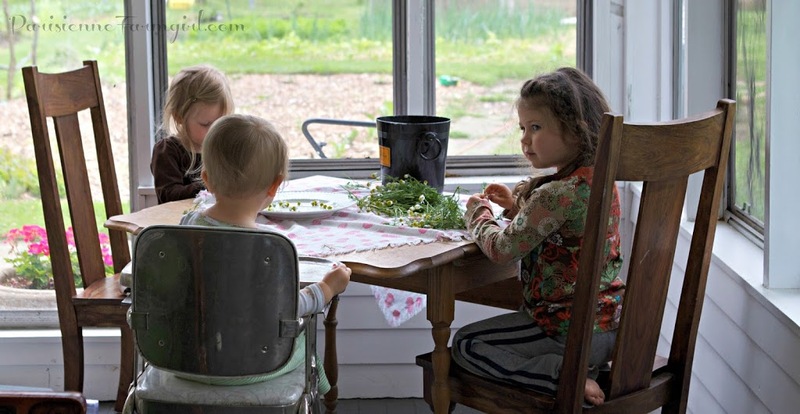 Chickens are this years Half-Pint farming project, but next year it’s expanding the herb garden. I get giddy just thinking about it. I love traditions … like having the same drink at the same time everyday. My husband and I have tea right after dinner every night. So fun. 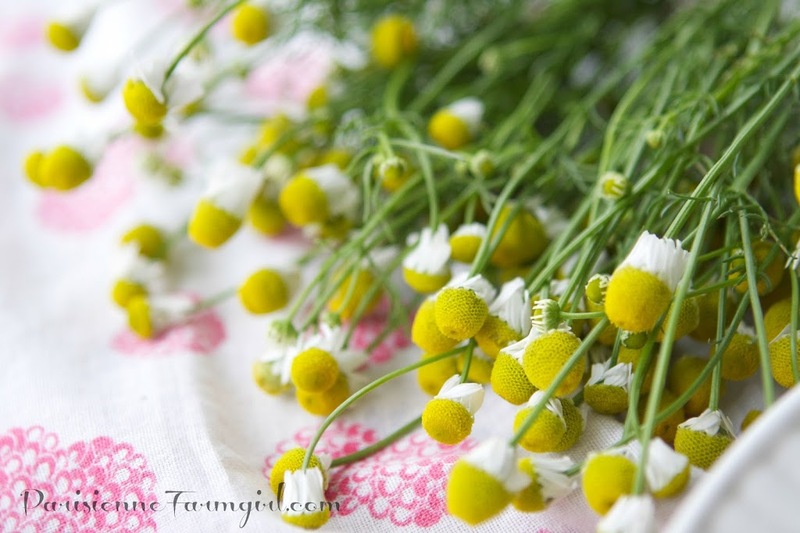 Chamomile is just divine! I have some very healthy lavender growing already (among other herbs). I bought some chamomile and calendula seeds to plant this year. But, the place I want to turn into my herb patch is waiting to be fenced in. My man had to build a pool deck first. He’s working on my herb project this week. Do you think it’s too late to plant my seeds? 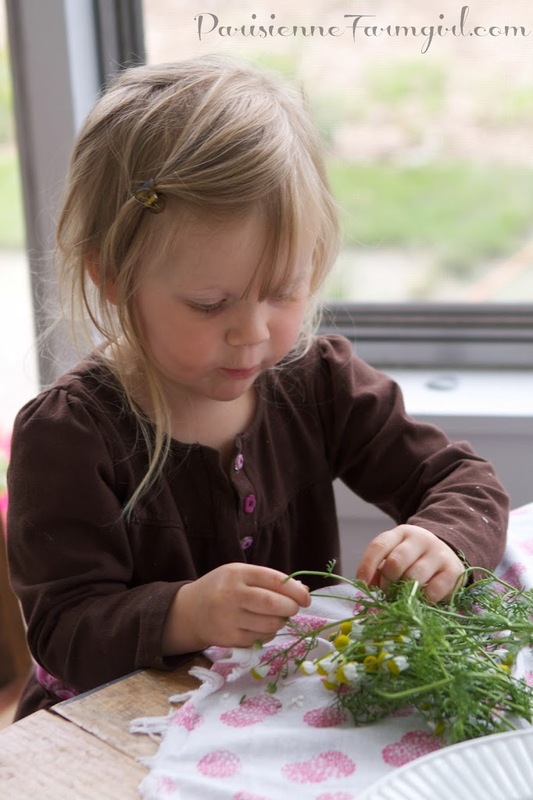 When I see your little ones helping it moves my heart to think about how they will be when they are grown. You are teaching them life, family, care for our earth. You will have them at your side for life.